The Snuggle Me is the original, award-winning, multi-functional lounging system for babies 0-6 months old. For 10 years the Snuggle Me has been recommended by natural birth professionals, pediatric chiropractors, and yoga practitioners. 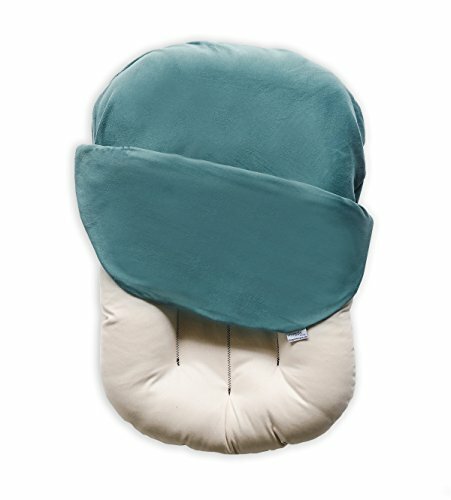 Snuggle Me is unique because of it’s their patented center sling which is slightly raised and unpadded. When baby is laid on top of the Snuggle Me, the sides will gently pull in to give baby the sensation of a hug. The Snuggle Me is a closed system, which ensures baby remains in their safe space, maintains a healthy neutral spine, and securely fits baby so they cannot roll or flip in the lounger itself. Organic and USA made the Snuggle Me is hand-crafted in Minnesota USA by highly skilled, local sewers. They also take great pride in sourcing all of their natural and organic materials from family-owned USA manufacturers. Snuggle Me is made with fully breathable materials sourced only from the USA. They are a CPSIA small batch manufacturer complying with all government safety standards in their division. All of their fabrics adhere to CPSIA certifications, which are the strictest certification standards in the world. The Snuggle Me is fully machine washable, contains zero flame retardants, zero ethylene glycol, no phthalates or BPAs. The Snuggle Me can be used for lounging, tummy time, for travel, sponge baths, infant massage, a changing station, and much more.